Since Nook Color appeared, it gained a lot of fans all around the world and developers just love it. Reason for such popularity is mainly in its price, but also in great hardware Nook Color is packing. The result of all that is great tweaking and modding community, so Nook Color is a must have for all of you who love to tweak and mod your gadgets. Nook Color is one of the cheapest tablets money can buy. 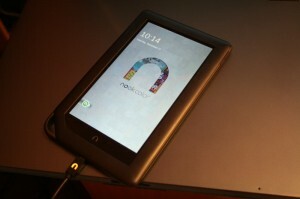 Nook Color costs just 200$ (155€). If you want it in Europe you`ll have to pay extra 50-70$ (40-55€) for shipping, and you`ll have to pay a tax on all that. 7” Samsung Galaxy Tab would be (nearly) a direct competition for Nook Color. In Croatia I couldn`t find it ( new ) beneath 380€. iPad and Galaxy Tab ( which are not directly comparable to Nook Color ) cost around 550€ in Croatia. Still, there are some cheaper Android tablets than Nook Color, but I couldn`t find anything that would fit my needs. Some have little RAM (256RAM), other don`t have any kind of support (by support, I mean great modding community and official updates of the manufacturer). Many of these cheaper tablets have a poor screen resolution, poorly optimized software full of bugs, and the worst of all – resistive screens. Resistive screens are real nightmare to work with on tablets. Any of better Android tablets you can`t buy for 200$ (155€) except from your mobile provider with some XXL monthly subscription on two years. Although, there is one good piece of hardware you can get for 200$. Kindle Fire. Hardware is pretty much the same as in Nook Color with exception of dual core processor in Kindle. But there is a major drawback in Kindle Fire (in my point of view) and that is 6GB of integrated space with NO MicroSD card expansion slot. 7” capacitive screen with IPS matrix and screen resolution of 1024×600, ARM Cortex A8 on 800Mhz ( which can be easily overclocked to 1-1.2Ghz without any problems) 512MB RAM, 8GB of internal memory ( not all of the memory is available to user ) and a MicroSD slot which supports microSD cards up to 32GB. The whole device feels very well built and solid, especially when you take price into account. Display quality is really great. Battery can hold up to 8h. All in all, you get a great hardware for a small price. 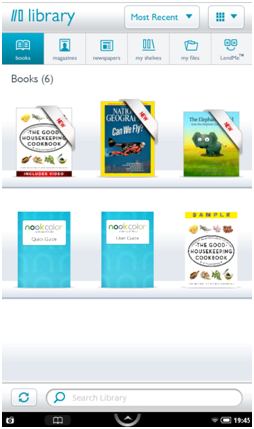 What you get from Nook Color by default? First of all, Nook Color is e-reader with limited functionality of a tablet. Functionality of a tablet is limited to apps that you can get from Barnes&Noble app store. You can easily turn your Nook Color to fully functional tablet with few steps, but we`ll get to that later. When you first start your Nook Color you`ll have to register it. You`ll need an account on Barnes&Noble site. All of the functionality of current B&N software on Nook Color is currently limited only for U.S. citizens. So you probably won`t be able to buy books, magazines and apps from B&N store. Library – Books, magazines, newspapers and your documents will be here. 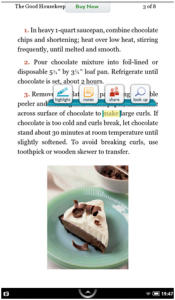 You can copy your documents easily to your Nook Color be simply connecting it to your PC and just c/p your documents to it. 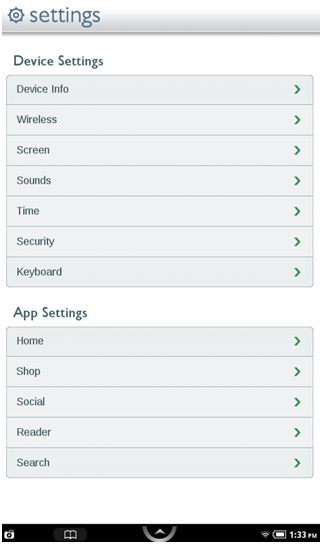 Shop – B&N app market, with only “few apps (about 1800 at the time of writing this ). There is no Android Market integrated. 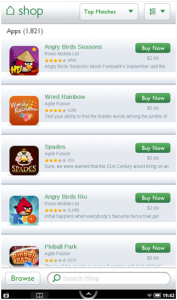 Apps – You can find all of your apps here. Web – web browser is solid. 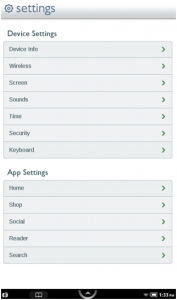 Settings – system settings for Nook. Library: As I already mentioned, all your books, magazines, newspapers and documents are here. You also have an option of borrowing the books. 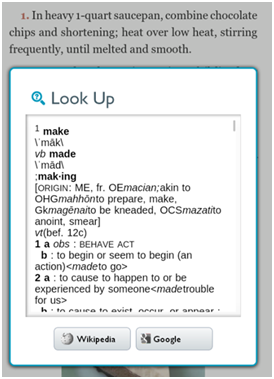 Books: You can highlight words or sentences, add a note, share or look up the word in a dictionary if you don`t understand it. 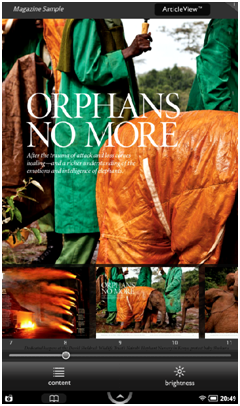 Magazines: They look great, colors are vivid, background and text look clear and sharp. 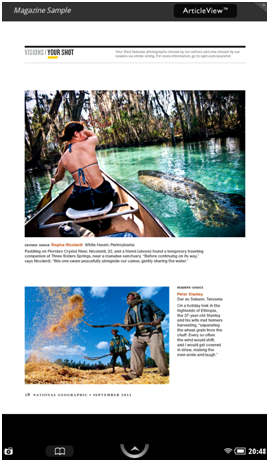 There is also an option of ArticleView with clean and increased text with no pictures. Shop: There is not much to be said about B&N store. There is whole 1.821 apps in this store at the time of writing this. Since choice of apps is very poor, I won`t waste my time on this feature. Apps: All of your bought apps go here. 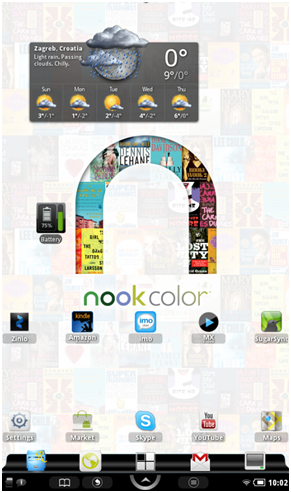 Default apps that came with Nook can be seen on the picture. Web browser: Pretty fast and very usable. All the standard options that the browser needs are included. Settings: Compared with standard Android smartphone or tablet there is not much to see here. All the settings on the Nook you can see in the picture. So, there is not much to be seen on stock Nook Color. Default Android installation on Nook Color is pretty locked down with small selection of apps and settings. On top of that all, you need to have U.S. registered credit card to be able to buy apps, or magazines/books. And what about rooted Nook Color? 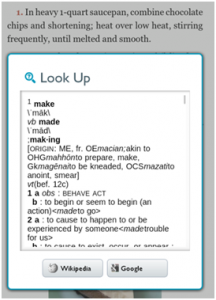 Plain and simple – rooted Nook Color can do everything that any other Android tablet can. Nook Color thrilled me the first time when I got my hands on it. Built quality is good, great screen, solid performance and on top of that all – small price. 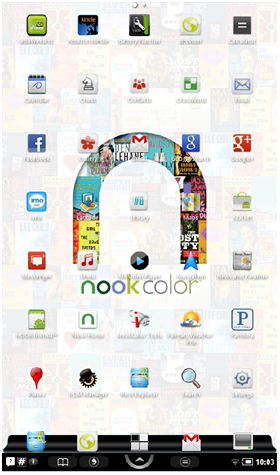 Only thing I wasn`t excited about was locked Android interface of Nook Color. After you root your Nook Color, all the Android apps of this world are in your hands. 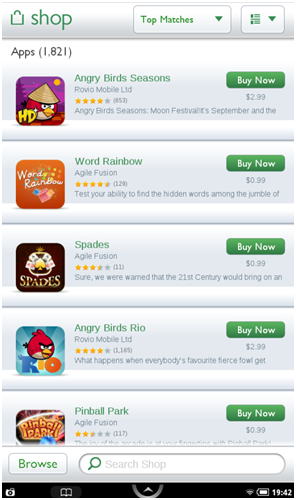 Android Market = all currently available apps. Zinio, Amazon Kindle, launchers, office apps, mail clients, tweaks, improvements. All that at your fingertips after you roots your nook Color. Overclocking is also one of the options after you root your Nook Color. ARM Cortex A8 which is inside Nook Color works without problems on 1-1.2Ghz. Everything works smooth and without problems after rooting. Watching movies on the Nook Color shouldn`t be a problem if you have fast enough MicroSD card ( Class 6 minimum). Adobe Flash sometimes can cause problems and unresponsiveness, but I saw faster machines choke with un optimized Flash. Enough said. Rooting Nook Color is a must. There is great choice of ROMs for Nook Color. You can choose between flashing them on MicroSD card or internal memory of Nook Color (emmc). Well known ROMs for Nook Color are CyanogenMod 7 ( quick, stable, even with enabled Bluetooth option) Nookie and MIUI Gingerbread. 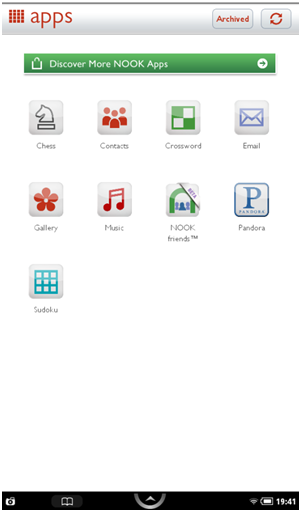 You can find more about custom ROMs for Nook Color on XDA Developers. Since ICS source code recently got out, ICS ROMs are expected for Nook Color. If your not satisfied with just rooting your Nook Color, there are plenty of custom ROMs to choose from. Wi Fi – Wi-Fi sometimes has a mind of its own. While at home I can connect to my WPA2 Wi-Fi network with DHCP enabled. But there are some problems with adhoc networks or networks that don`t have DHCP enabled, to be exact, you can`t connect on these networks with only rooted or stock Nook. But there is a solution for both problems, if you are rooted. Adhoc network problem can be solved with ad hoc fix which enables you to use adhoc networks. Solution for Wi-FI networks with fixed IPs is called WiFi Static and can be found on Android Market. Navigation – Only software buttons specific for Nook Color requires some time to get used to. Overclocking – absolutely must do on Nook Color. Nook Color works better and faster with no issues if it`s done properly. Best of all battery life stays the same, and there haven`t been any cases of fried Nooks. MicroSD – if you`re going to buy one, Class 6 should be minimum. 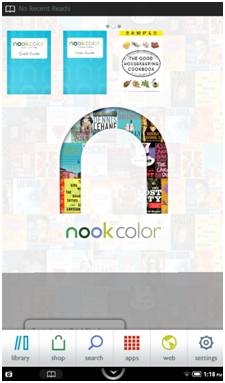 Nook Color is a great hardware at a bargain. Nook Color can be very useful device if you choose to root it or put custom ROM on it. There aren`t any significant objections in everyday work or performance, especially when you put a price of a device into perspective. How to map Skydrive as network folder?